The Beagley's Blog: Catch up time! Ok so i have kinda slacked the last month in posts. This is what has happened. Tyler's great Grandma Daisy Mackay passed away. We were one of the last people to see her alive, and we were really suprised when she passed away a few hours later. She seemed to be doing really well, and was so excited to see us. The funeral went well. I sang a song that Tyler's sister Maddi had. It was such a pretty song! Thanks Maddi for letting us use at, and we wish that you and Josh could have come. It really got me thinking about how life can take you by suprise. You can never be totally ready! We went to Tyler's mission reunion. I heard the funniest stories about him! If you want to hear his most embarrassing one, you will have to ask him because i don't think he would want me to post it! But it involves a place called Hillbilly Hotdogs! :) It was really neat to see all his old companions and friends. Now i can put face with his stories. It was a lot of fun! Genereal Conference was good! We went back to Richfield for the first time since we moved up to Salt Lake! It was good to be back and see our friends and family. We had a lot of good food too! If anyone wants a really good chip dip recipe let me know! I finally got the Beagley family recipe for shrimp potatoe chip dip! Tyler has been working his rear end off with school! He has been so busy, but he is handling it well! Hopefully he gets through this semester ok! I know he will do great! I have just been very busy with work and loving every moment of it!!! Oh and i almost forgot!!! We got a washer and dryer! The front loading kind and i'm so excited! I love them! It's funny how you start to get excited about things like that! 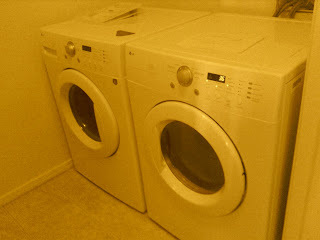 Here is our new washer and dryer! I am sorry to hear about Tyler's grandma. I am jealous you got down south, we still haven't made it back to Ephraim since we moved in Jan. I am so excited about your new washer and dryer, that is so awesome. We need to get together with you guys! Joe is starting now so things are even crazier! SOOOO jealous of the new washer and dryer!!! I'll trade you straight accross ;) Love you! It IS funny what you get excited for when you get older. I would be way excited for those! They're way nice, I'll trade ya too lol!